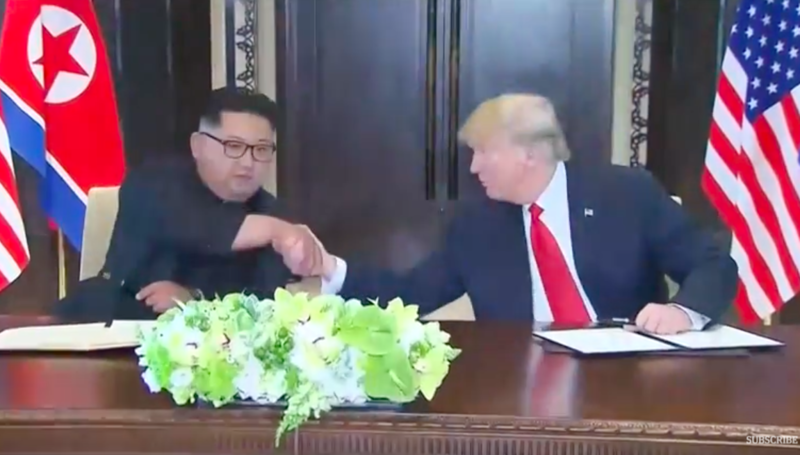 Kim Jong Un and President Trump shake hands after signing their joint declaration today. The Philippines has commended the US and North Korea for the “successful” summit between President Trump and Kim Jong Un in Singapore. The two leaders signed a joint document today (Tuesday, June 12) stating their full commitment to working “toward complete denuclearisation of the Korean Peninsula”. In a statement, the Department of Foreign Affairs expressed optimism that the face-to-face meeting between the two leaders would lead to concrete actions toward the denuclearisation of the Korean Peninsula. “We strongly commend all parties for their unremitting efforts and commitment that led to the realisation of this historic meeting,” Foreign Secretary Alan Peter Cayetano said. The statement also expressed hope that the meeting between the two leaders would mark “the establishment of lasting peace, stability and security in the region”. It also stressed the importance and value of dialogue and diplomacy in resolving issues. “The Philippines stands ready to contribute to the realisation of these goals,” the statement concluded. MANILA 12 June 2018 – The Philippines welcomes the successful conclusion of the landmark Summit between President Donald Trump of the United States and Chairman Kim Jong Un of the Democratic People’s Republic of Korea in Singapore today, 12 June 2018. We strongly commend all parties for their unremitting efforts and commitment that led to the realization of this historic meeting. While mindful of the many challenges that still lay ahead on the road to achieving lasting peace in the Korean Peninsula, the first ever face-to-face meeting between the leaders of the two countries underscores the importance and value of dialogue and diplomacy in seeking resolution to outstanding issues among all concerned parties. The Philippines hopes that the precedent set today will provide impetus to further concrete actions towards the goals of denuclearization of the Korean Peninsula, the establishment of lasting peace, stability and security in the region. The Abu Sayyaf terrorists who landed on Bohol yesterday were planning a mass kidnapping at a tourist resort, the military has said. Since the earliest days of photography, visitors to the Philippines have been keen to capture the grace and beauty of it's women. Panama disease, an infection that ravages banana plants, has been sweeping across Asia, Australia, the Middle East and Africa. Eight people on their way to a thanksgiving event were killed when a dump truck fell into a ravine in Tabuk City, Kalinga.